I’m not usually one for statistics-driven infographics, but I was glad to have learned this. Also, the visuals were at least clear and unoffensive to the eyes. As always, the stats infographics are somewhat lame, and the visuals do nothing for the information. It’s a bit of traffic pandering, which I seem to be clearly accommodating. Also, I know the goal was to show how well Google+ seems to be doing, but the facts and figures are a bit biased in Google+’s favor. For example, what about all the photos? Pictures are the reason why a lot of people I know joined Facebook in the first place, and are a core functionality. Even if Google+ developed an outstanding photo platform, or found a nifty and clean way to integrate with (Google-owned) Picasa there’s a legacy to the accumulation of Facebook albums, and people won’t necessarily be keen to port everything over, nor would they be thrilled about uploading everything twice, for both camps. All to say, whether or not Google+ is meant to run alongside Facebook or genuinely try to draw users away, to not mention photos in this infographic is a bit unforgivable, to me. 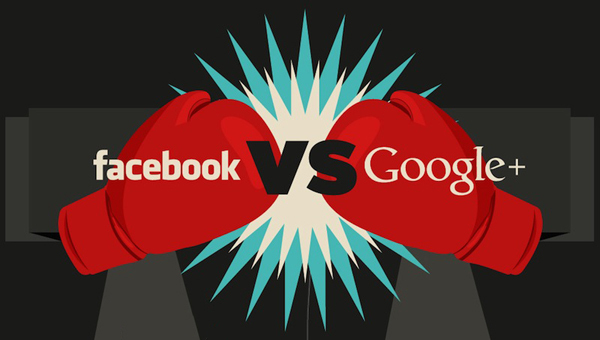 Still, I am following the rise of Google+ closely, and like to see Facebook seemingly on the run. This infographic was created by Jason Delodovici, who posted it at Single Grain here. This entry was posted on July 26, 2011, 2:12 pm and is filed under Science, Technology, & Internet. You can follow any responses to this entry through RSS 2.0. You can leave a response, or trackback from your own site. This is a terrible infographic please try again.